A sleek men's titanium ring. Featuring a double groove design with two central diamonds for a luxurious finish to this sophisticated ring. A stylish ring designed with him in mind. 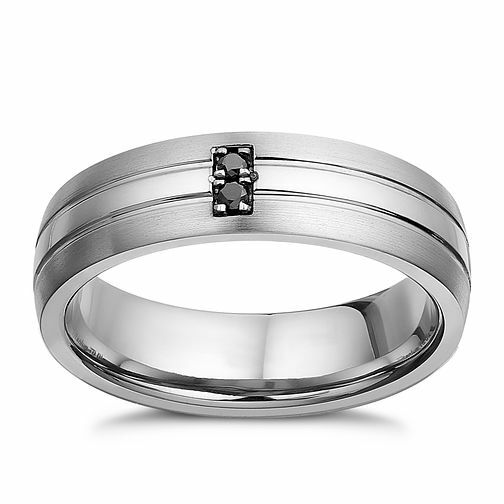 Titanium treated black diamond men's ring is rated 5.0 out of 5 by 3. Rated 5 out of 5 by Anonymous from Lovely This was bought for an 18th Birthday present and it is not until the 27th January, so will let you know if it gets the right result.Here's hoping. Rated 5 out of 5 by Anonymous from Sons birthday Picked this out for my sons 20th.. He loves it, all is good with the world.